Last edited by rumrunn6; 04-28-18 at 06:37 PM. I've ridden much worse for many hundreds of miles. They do seem a little weathered for not even quite 2 yo. You leave them outside in the desert for much of that time? Only time that happened to me, I left my bike with Michelin Pro3 service course tires in a shed over a couple of summers (easily 110-120*F max temp and 5*F min). 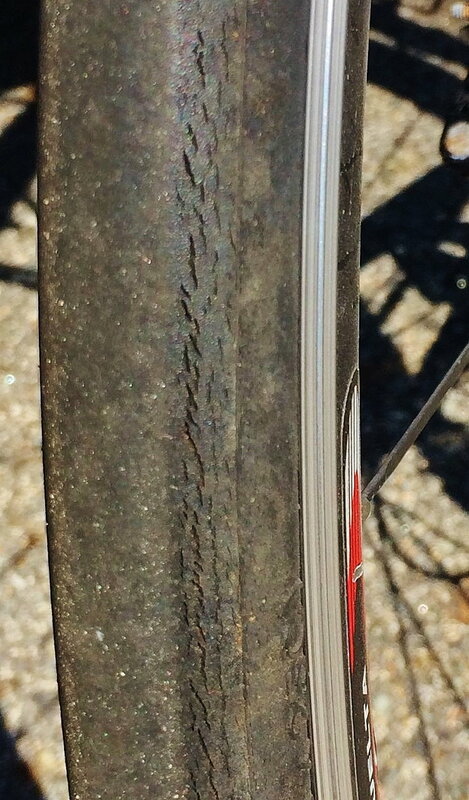 When I finally got back on the bike, the sidewalls on the rear tire just went away after the first 15 miles. Not more than 1000 miles on them. Last edited by rumrunn6; 04-29-18 at 02:43 AM. That tire may be relatively new to the OP but who knows how long they were in storage at the distributor and how they were stored. I try to buy tires from a large dealer with fast inventory turnover. Miles matters, not time. How many miles on the tire? Michelin Pro are not amazing tires anyway so it really isn't a great loss. In the basement, hmmm, where in the basement? I ask because if you have it near an electric motor (like an A/C or heater fan in the furnace), that could be the result of ozone exposure to the rubber. Ozone is not kind to rubber - think car tires, wiper blades, window seals, etc., especially in urban area with more pollution. That nice dry spot in the basement behind the furnace is good with limiting corrosion, but bad if there is an electric motor generating ozone. You will get tire rot. I left a bike near the refrigerator for months, & the brand new tire deteriorated. Last edited by rumrunn6; 05-01-18 at 01:06 PM. Ozone from electric motors such as the fan blowing to your central heat system , has negative effects on rubber.. It doesn't have to be right next to an electric motor. "In the vicinity" could mean just in the basement. Basements usually aren't all that well ventilated and the ozone will find something to react with. Ozone is very aggressive towards rubber. Maybe related, not sure. My tires never near anything toxic. It looks like you've worn significant flats on the tread of the tires in two years. Those tires are close to what I consider done. Others may disagree. I was just talking to Joe (a guy I consider truly expert), a local LBS mechanic and shop manager. We were talking about tubeless tires for road bikes, and he said that he's seen some guys with tubeless ride the tires down to the fabric bias plys. Me, I just rotate the tires when the rear tire gets a pretty good flat surface or I see fabric or warning bars. Then I discard the rear, rotate the front to rear, and replace the front. Best tire on the front, always, and at the time of rotation, the rear tire is in very good shape. This approach also maximizes the service life I get out of each tire. @ rumrunn6 - I may have missed it, did the bike sit unused for any significant period of time? My wife's bike had the same thing happen to a near brand new set of tires (less than 500mi) after the bike was left hanging on the wall hooks for about 5-6 months. @ WizardOfBoz - I'm one of the "run it down to the threads" guys. I run tubeless and I'll run my rear down to the casing before I switch it, though I'm far less cavalier with the front. I used to rotate the front to back, but with tubeless it just got to be too much of a pain, so I'll replace the front with every other rear. Edit: Are mentions not working right with the updated site? I used to rotate the front to back, but with tubeless it just got to be too much of a pain, so I'll replace the front with every other rear. That's probably more time-efficient for sure. apologies to OP for derailing the thread... I did find some posts about the new site update indicating that mentions and a few other things aren't working right. Notifications is one of them. Sounds like they may or may not be working on them. Lot of people complaining. Yeah, I just checked - your mention didn't show up in my list of mentions. Hope they fix that - or turn mentions off entirely. I guess I could do that, but it kind of defeats one aspect of the forum. Yup. One of the things I like(d) was being able to just tag someone without having to do a full quote. @ rumrunn6 - I may have missed it, did the bike sit unused for any significant period of time?Edit: Are mentions not working right with the updated site? I have found that type of cracking to be characteristic of Michelin tires, both cycle and automotive. It seems to be a response to UV or ozone or both. I had a pair of Michelin Kevlar Bib-TS tires and the cracking went right down to the carcass cord. Time for new tires.